When a long term tenant of your property decides to leave, this might create a problem for the landlord. In some cases, your tenants go bankrupt halfway through the lease and could not pay the rent, despite that there is a contractual obligations to do that. You would have the headache of trying to find new tenants for the property. And if you cannot find one, you do not get any rent for the vacant period. These are some of the trials and tribulations if the company you are invested in, decides to acquire a property in a sale and leaseback arrangement. In such an arrangement, the seller decides to sell to a buyer their property they owned. The seller then decides to lease back the premises from the buyer for a duration of time. The seller is able to make a profit on the property, or more importantly, get immediate cash flow that they can redeploy into their business, fund working capital needs, or pay down debt. The buy will get an asset that has a predictable cash flow, a ready tenant, and perhaps a predictable return on investment. However, how easy is it to manage the property after the initial lease term back to the seller? We look at two case study to examine the potential pitfalls. Soilbuild Business Space, an industrial REIT currently providing a dividend yield of 9.6%, purchase a property at 72 Loyang Way in 2015 on a sale and leaseback with Technics Oil and Gas. This means that Technics Oil and Gas sold the industrial buildings to Soilbuild Business Space for S$97 mil and then lease from them for 15-16 years. This frees up the cash flow for Technics Oil and Gas and Soilbuild gets a long term tenant. During the 2015 Oil and Gas crisis, Technics Oil and Gas ends up in a very bad position. They eventually cannot pay the rent. Soilbuild have built in a $11.8 mil in rent deposit. When Technics was unable to pay the rent, Soilbuild can draw upon these rent deposits to cover the rent. The problem for Soilbuild is that there are restrictions to who they could rent to for 72 Loyang Way. They can only rent to Oil and Gas Companies. Until it was sold off in Mar 2019 this year for S$34 mil to Kim Hock Enterprise. The land lease left is 19 years and they sold off inclusive of all the mechanical equipment in it. Note the price difference in acquisition price and sale price in 4 short years. I think the main difference is that for short land lease buildings, the property is valued no just on the building but very much on the existing tenant lease that came with it. Since there is no visible tenant renting for a long, reliable period, the price of the property is essentially 4 walls. The other reason is that the land lease is short, so the depreciation in the land lease is swifter than a property with 80 year land lease left. I do think the lack of a secure tenant contribute very much to the difference in price. The original purchase locks in a 15-16 year tenant. If we wish to have a non REIT example we could always cite Boustead Project’s sale and leaseback purchase of 36 Tuas Road in 2013. 36 Tuas Road was purchased from Ausgroup, which is also in the oil and gas business. The acquisition was purchased for $39 mil. Ausgroup will then lease from Boustead Projects for 12 years till 2025 for 12 years. The land lease is 30 years starting in 1995. Thus the land lease is about 12 years as well. The estimated base rent was $3 mil per year + 6% in land rent to JTC. But Ausgroup was not able to pay up like Technics. And in 2017, both Boustead Projects and Ausgroup mutually agreed to terminate the lease. 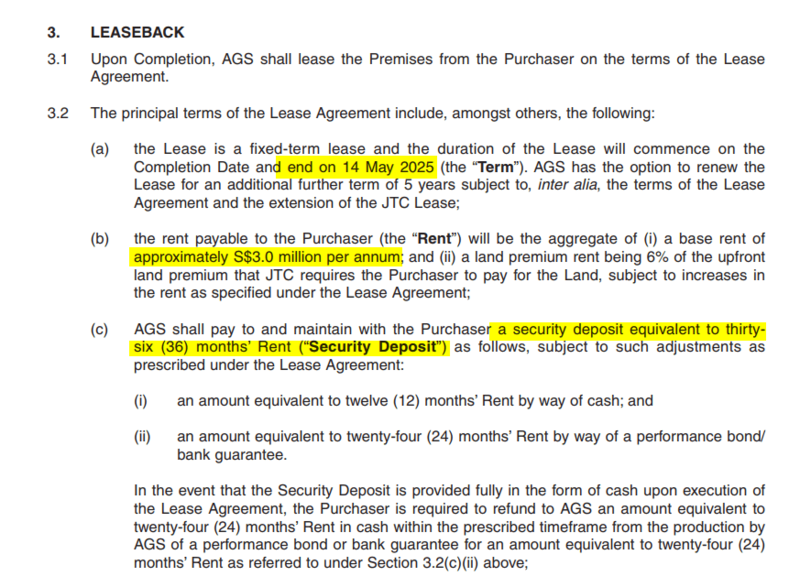 Boustead Projects was shrewd, in a way, to secure 3 years of rent as bank guarantee (almost $9 mil). They took a $3.4 mil in impairment on the value of their $39 mil purchase. The bigger problem, as Soilbuild’s experience is to rent out 36 Tuas Road. 2.5 years since the time that Ausgroup could not pay the rent, and Boustead Projects are still trying to rent out 36 Tuas Road. We note that they are trying to rent out on a lease term of 1 year at $1 psf. If we compute the original base rent, divide by 12 months, divide by the net lettable area of 123,000 sqft, the rent is $2 psf. So Ausgroup is trying to rent out at half the original rent. Was the original rent inflated? Or are they listing at a low psf? 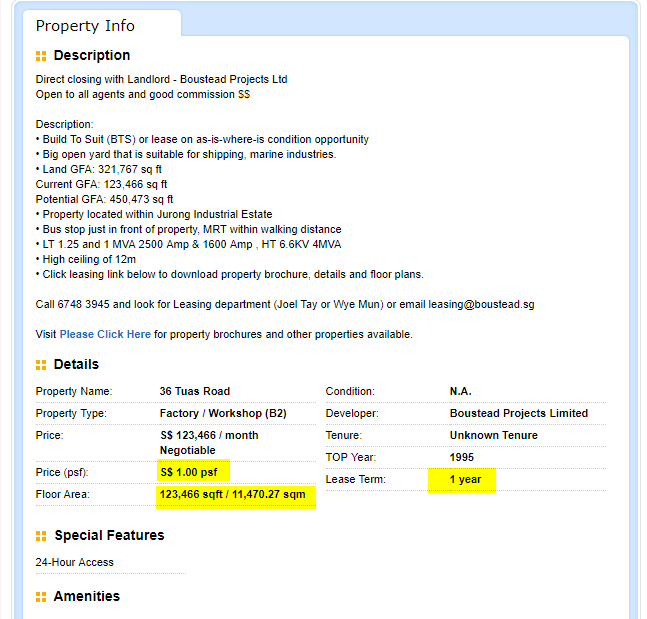 I think to sell off the property at a premium, the valuation of 36 Tuas Road needs to be high. And if the large part of the property valuation is the robustness of the tenant, the length of the tenant lease, then to ensure a high value, they have to rent at a high rent. This is probably the problem with sale and leaseback. If the tenant lease ends and the existing tenant do not want to continue to lease the premises, how easy is it for the landlord to rent it out to others? This is a problem not just for Singapore based properties but also for overseas one. Re-leasing properties to new tenants. This is probably a real challenge for the REIT manager. It is probably an aspect where a quality property manager can add value to shareholders and perhaps there is a premium for a REIT with good leasing team. Another way of looking at S&LB transactions is that such transactions are a form of off-balance sheet financing for sellers of buildings, with the long-term rental expense paid to purchasers being a combination of principal repayment and interest expense. One would expect such financing to be more expensive than normal routes such as secured bank loan, but the seller may not want to load its balance sheet with a financial liability if it is already heavily geared and would be willing to pay a higher-than-normal financing rate. If the seller, during the tenancy period, falls into difficulties and cannot meet its rental obligations, it would be difficult for the landlord to find a replacement tenant that will pay the same rental, as the replacement tenant would not have had the benefit of the initial sale proceeds and would not want to pay an above market-rate rental rate. My own view is that a landlord can expect rental yield to fall if the original S&LB tenant falls away. Hi Dee, that is really insightful. I didnt view it as a principal + interest repayment. If it did, then it does explain why it is “higher”. When you say off balance sheet do you mean that the expenses are operating leases that in past accounting, was kept off balance sheet? Based on your explanation, it does seem like it is rather tough for the buyer isn’t it, unless the sale and lease back has good potential for them to lease out at higher rent like what USA REIT STORE did for the set of Sears stores.